The hits keep coming for Johnny Manziel, as the 23-year-old free-agent quarterback has lost his biggest marketing deal. Nike spokesman Brian Strong told ESPN that Manziel, who was signed by the shoe and apparel giant in March 2014 to a multiyear deal, is no longer an endorser of the brand. Sources said Nike terminated the deal some time after the NFL season ended. The former Cleveland Browns quarterback had already been dumped by his original contract agent, Erik Burkhardt, and his marketing agent, Maverick Carter. His second contract agent, Drew Rosenhaus, left him on Tuesday, a source told ESPN NFL Insider Adam Schefter. Now Manziel has lost his biggest marketing deal. In addition, Manziel's deal with Panini America has expired, a source said, though the sports collectibles company is still selling Manziel products on its site. Panini had signed Manziel in his rookie year to an exclusive autograph deal but had recently slashed prices on Manziel-signed Browns items. Nissan and MusclePharm, brands that used the QB, are no longer promoting an association. Other deals Manziel signed his rookie year, including with Snickers and McDonald's, were one-off commercial spots that concluded by the time Manziel went to rehab in early 2015. After signing Manziel, Nike didn't wait to cash in on the 2012 Heisman Trophy winner. Nike dressed him in a special outfit for his Pro Day and sold the gear on its website. Less than a month after he was drafted as the 22nd pick overall by the Browns in 2014, Nike began selling "Money Manziel" shirts for $30 each. Nike also reached agreement with Manziel to exclusively use "Johnny Football," his college nickname that he had filed to trademark in 2013. Manziel never received the formal registration to the mark. Up until the start of the 2015 season, Nike had sold more Browns Manziel jerseys than those of any other player. Manziel started in only eight games over two seasons for the Browns. In 15 games played, he threw as many interceptions as touchdown passes (7). 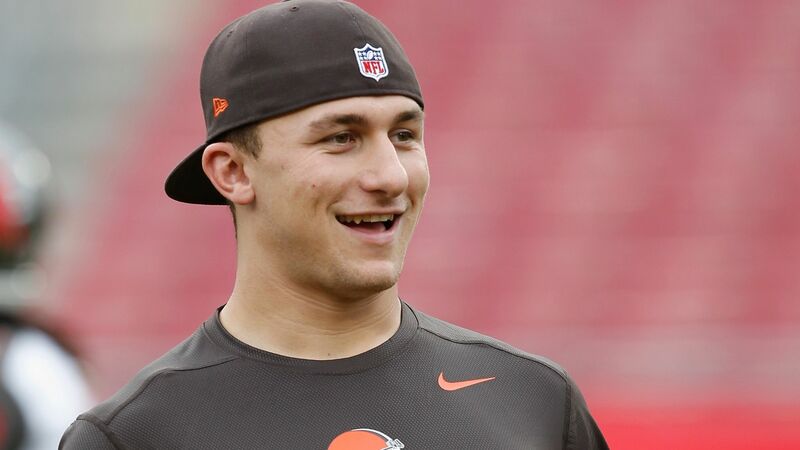 After his partying ways and troubles with the law, Manziel was waived March 11. This is the sixth contract Nike has terminated in the past three-and-a-half years. Those whose deals were ended prematurely include Lance Armstrong, Ray Rice, Adrian Peterson, Oscar Pistorius and Manny Pacquiao. Manziel is currently the subject of a grand jury investigation in Dallas into whether he assaulted his former girlfriend. The NFL is investigating whether Manziel violated its personal conduct policy in that incident. Dallas prosecutors will present the Manziel case to a grand jury on Thursday, and an indictment could be announced as early as Monday. Peter Kings looks back at covering Johnny Manziel at the NFL combine two years ago and hearing NFL teams say they believed Manziel had turned his life around.